Story: A failed wizard is forced to guide a guileless tourist through a magical land, during which time they meet ridiculous versions of familiar fairytale characters/creatures, save the world(s), and come out as better people. Review: Judging this as a kids’ movie, and it can hardly be considered otherwise, it’s one of the best made in recent years. The writing is not subtle, but it really isn’t trying to be so it doesn’t matter. There are some hilarious one-liners, dozens of somewhat obvious movie homages, and one of the best uses of the banana peel gag I’ve seen. On top of that, it’s in this miniseries that David Jason (from Touch of Frost) and Sean Astin (from LOTR) have finally found the roles to which they have always been destined – as is even discernible from their characterizations in the above image. 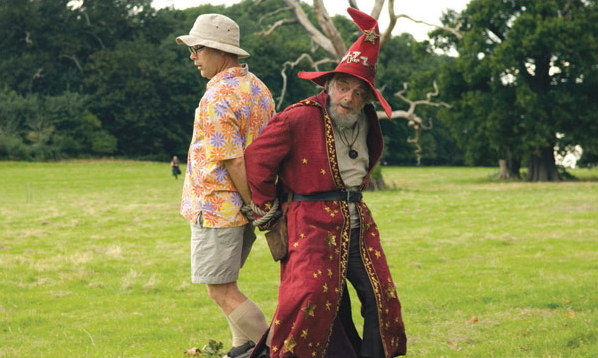 Jason plays a screwy old wizard-wannabe and Astin plays a dopey pseudo-American tourist. These actors are perfectly suited to their parts. Incidentally, the sound design in this TV movie is ingenious. I never thought there was a way to make a wooden box seem happy and sad with a few well-timed squeaks. Bravo to the sound team on this flicker. Recommended for: Kids, families, and people who just happen to like silly fantasy movies. Content Notes: (G) – not really serious violence, and the few crude innuendos would go over any kid’s head. This entry was posted in Review and tagged acting, Critical Analysis, movie review, Movies, Mythology, Screenwriting, television, TV. Bookmark the permalink.